vitamin C, a substance found in many fruits (especially citrus fruits and tomatoes) and vegetables. It is an essential element of the diet; lack of it can lead to scurvy or to less severe conditions, such as delayed healing of wounds. Solutions of ascorbic acid deteriorate rapidly, and it is not stored in the body to any extent. Large doses of commercial preparations may cause gastrointestinal irritation. Recommended dietary intakes are 60 mg daily for adults, an amount available from one to two oranges. See also vitamin. Preparations of ascorbic acid are used as antiscorbutics and nutritional supplements, as as aids to improve absorption in the treatment of iron deficiency anemia and to improve chelation during deferoxamine therapy for chronic iron toxicity; administered orally or by intravenous or intramuscular injection. Ascorbic acid is also used as an aid in the radioactive labeling of red blood cells for various studies. A vitamin used in preventing scurvy, as a strong reducing agent, and as an antioxidant. /ascor·bic ac·id/ (ah-skor´bik) vitamin C, a water-soluble vitamin found in many vegetables and fruits, and an essential element in the diet of humans and many other animals; deficiency produces scurvy and poor wound repair. It is used as an antiscorbutic and nutritional supplement, in the treatment of iron-deficiency anemia and chronic iron toxicity, and in the labeling of red blood cells with sodium chromate Cr 51. A water-soluble vitamin, C6H8O6, found in fruits, potatoes, peppers, and leafy green vegetables or produced synthetically. A deficiency of ascorbic acid causes scurvy. Also called vitamin C.
a water-soluble, white crystalline vitamin present in citrus fruits, tomatoes, berries, potatoes, and fresh green and leafy vegetables, including broccoli, brussels sprouts, collards, turnip greens, parsley, sweet bell peppers, and cabbage. It is essential for the formation of collagen and fibrous tissue for normal intercellular matrices in teeth, bone, cartilage, connective tissue, and skin, and for the structural integrity of capillary walls. It also aids in fighting bacterial infections and interacts with other nutrients. Signs of deficiency are bleeding gums, tendency to bruise, swollen or painful joints, nosebleeds, anemia, lowered resistance to infections, and slow healing of wounds and fractures. Severe deficiency results in scurvy. A large excess of ascorbic acid may cause a burning sensation during urination, diarrhea, skin rash, and nausea and may disturb the absorption and metabolism of cyanocobalamin. Results of tests for glycosuria, uric acid, and iron may be inaccurate when the patient is receiving large amounts of the vitamin. Also called antiscorbutic vitamin, vitamin C. See also ascorbemia, infantile scurvy, scurvy. A vitamin that promotes the growth, formation and maintenance of bones and teeth, the repair of tissues and blood vessels, and increases resistance to infections; it is ingested in the diet in citrus fruits, tomatoes and leafy green vegetables. Agent used in preventing scurvy, as a strong reducing agent, and as an antioxidant. 1. Any substance that liberates hydrogen ions (protons) in solution; a hydrogen ion donor. An acid reacts with a metal to form a salt, neutralizes bases, and turns litmus paper red. 4. Slang term for lysergic acid diethylamide (LSD). C2H4O2, the acid that gives the sour taste to vinegar. It is also used as a reagent. Glacial (highly purified) acetic acid contains at least 99.5% acetic acid by weight. C3H4O2, a colorless corrosive acid used in making acrylic polymers and resins. Any of a class of water-soluble acids derived from fruit or milk, having a hydroxyl moiety in the first position in the molecule. AHAs are used in chemical peels and other skin care products to remove the outer layer of the epidermis. This chemical exfoliation is promoted for its cosmetic effects on wrinkled or sun-damaged skin. C18H30O2, an omega-3 fatty acid derived from plants, esp. seeds (canola oil, flaxseed, walnuts and pumpkins) and from some fish (salmon and mackerel). C8H14O2S2, a natural coenzyme and antioxidant, used for short-term treatment of peripheral neuropathies. C6H13NO2, a hemostatic drug. It is a specific antidote for an overdose of a fibrinolytic agent. C20H32O2, an omega-6 fatty acid formed by the action of enzymes on phospholipids in cell membranes. The acid is found in many foods. It is metabolized primarily by the cyclo-oxygenase or 5-lipoxygenase pathways to produce prostaglandins and leukotrienes, which are important mediators of inflammation. Corticosteroids inhibit formation of arachidonic acid from phospholipids when cell membranes are damaged. Nonsteroidal anti-inflammatory agents such as salicylates, indomethacin, and ibuprofen inhibit the synthesis of prostaglandins and leukotrienes. C10H18N4O6, a compound intermediate in the synthesis of arginine, formed from citrulline and aspartic acid. C17H11NO7, an acid derived from Aristolochia, a genus of flowering plants, and used as an herbal remedy. It is promoted as an aphrodisiac, a weight loss agent, and an anticonvulsant. The acid is a known carcinogen, and its use has been associated with and may cause end-stage renal disease and cancers of the urinary tract that may occur many years after usage has stopped. C4H4N2O3, a crystalline acid from which phenobarbital and other barbiturates are derived. C7H6O2, a white crystalline acid having a slight odor. It is used in keratolytic ointments and in food preservation. Saccharin is a derivative of this acid. An acid containing hydrogen and one other element. Boric acid is toxic and should be used only rarely. It is particularly dangerous because it can be accidentally swallowed by children or used in food because of its resemblance to sugar. C4H8O2, a viscous fatty acid with a rancid odor, derived from butter but rare in most fats. It is used in disinfectants, emulsifying agents, and pharmaceuticals. H2CO3, an acid formed when carbon dioxide is dissolved in water. Any acid containing the carboxyl group –COOH. The simplest examples are formic and acetic acids. C24H40O5, a bile acid formed in the liver by hydrolysis of other bile acids. It is formed from the breakdown of cholesterol and helps digest consumed fats. C9H8O2, an insoluble white powder derived from cinnamon. It is used as a flavoring agent in cooking and in the preparation of perfumes and medicines. C6H8O7, an acid found naturally in citrus fruits or prepared synthetically. It acts as a sequestrant, helping to preserve food quality. Any of the isomers of linoleic acid effective against cancer, obesity, diabetes, and atheromata in laboratory rodents. CLAs have not been shown to have similar beneficial effects in humans. C3H7NO5S, an acid produced by the oxidation of cysteine. Further oxidation produces taurine. C24H40O4, a crystalline acid found in bile. C22H32O2, an omega-3 fatty acid found in the oils of cold-water fish and in algae. DHA plays a role in the development of nerve cell membranes and is required for the normal growth and development of the infant brain. Lack of DHA has been linked to growing numbers of people suffering from depression. C15H20NO6, a toxin that resembles glutamate, the main excitatory amino acid of the brain. When ingested, it may cause continuous seizures. C20H30O2, an omega-3 fatty acid found in fish oils, containing 20 carbons and five double bonds. Uric acid derived from purines undergoing metabolism from the nucleic acid of body tissues. Uric acid derived from purines from food made up of free purines and nucleic acids. Any of numerous monobasic acids with the general formula CnH2n+1-COOH (an alkyl radical attached to a carboxyl group). Folic acid should not be used to treat pernicious anemia (a vitamin B12 deficiency) because it does not protect patients against the development of changes in the central nervous system that accompany this type of anemia. C20H23N7O7, the active form of folic acid. It is used to counteract the effects of folic acid antagonists and to treat folic acid deficiency anemia. HCOOH, the first and strongest member of the monobasic fatty acid series. It occurs naturally in certain animal secretions, e.g., the sting of insects such as bees and ants, and in muscle, but it is also prepared synthetically. C6N2O4H10, an intermediate product in the metabolism of histidine. The form in which a fatty acid leaves the cell to be transported for use in another part of the body. FFAs are not esterified and may be unbound (not bound to protein). In the plasma, the nonesterified fatty acids released immediately combine with albumin to form bound free fatty acids. C4H4O4, one of the organic acids in the Krebs cycle. It is used as a substitute for tartaric acid in beverages and baking powders. Concentrated nitric acid (more than 86% nitric acid) that emits toxic fumes that cause choking if inhaled. A radiographic contrast agent, used in magnetic resonance imaging to enhance the appearance of blood vessels. Contrast agents containing gadolinium should not be given to patients with diminished renal function. C6H2(OH)3COOH, a colorless crystalline acid. It occurs naturally as an excrescence on the twigs of trees, esp. oaks, as a reaction to the deposition of gall wasp eggs. It is used as a skin astringent and in the manufacture of writing inks and dyes. C4H9NO2, the principal inhibitory neurotransmitter of the brain. C18H30O2, an essential fatty acid promoted by alternative medicine practitioners as a treatment for skin and inflammatory disorders, cystic breast disease, and hyperlipidemia. CHO(CHOH)4COOH, an oxidation product of glucose that is present in the urine. Toxic products (salicylic acid, menthol, phenol) that have entered the body through the intestinal tract are detoxified in the liver by conjugation with glucuronic acid. CH2OH·CHOH·COOH, an intermediate product of the oxidation of fats. C26H43NO6, a bile acid that hydrolizes to glycine and cholic acid. C2H4O3, an alpha-hydroxy acid derivative used to remove the outer layer of skin to rejuvenate its appearance. C2H2O3, an acid produced by the action of glycine oxidase on glycine or sarcosine. C6H5CONHCH2COOH, an acid formed and excreted by the kidneys. It is formed from the combination of benzoic acid and glycine. The synthesis takes place in the liver and, to a limited extent, in the kidneys. An acid formed in the liver, kidney, and other tissues. It is metabolized to form creatine. HCl, an inorganic acid normally present in gastric juice. It destroys fermenting bacteria that might cause intestinal tract disturbances. Exposure to the skin and aerodigestive tract causes severe burns with local necrosis and systemic manifestations resulting from disordered calcium and potassium metabolism. Treatments with calcium gluconate can be beneficial. Any of the acids containing one or more hydroxyl (–OH) groups in addition to the carboxyl (–COOH) group, e.g., lactic acid, CH3COHCOOH). A chemical that, when bound to radioactive technetium, is used to demonstrate the formation and flow of bile. C4H8O3, any of the acids present in the urine, esp. in diabetic ketoacidosis, when the conversion of fatty acids to ketones increases. C6H8O8, an herbal extract promoted for the treatment of weight loss. Placebo-controlled studies have not found any benefit to the treatment. HClO, an acid used as a disinfectant, deodorant, and bleaching agent. It is usually used in the form of one of its salts. An acid formed as a result of oxidation of amino acids in the body. An acid containing no carbon atoms. C12H13I3N2O3, a radiopaque agent formerly used in cholecystography. C11H12I3NO2 , a radiopaque contrast medium used in radiographic studies of the gallbladder. Any organic acid containing the ketone CO (carbonyl radical). CH3COCH2CH2COOH, an acid formed when certain simple sugars are acted on by dilute hydrochloric acid. C24H48O2, a saturated, naturally occurring fatty acid present in certain foods, including peanuts. It is also found in wood tar, various cerebrosides, and in small amounts in most natural fats. The acid is also a by-product of lignin production. C18H32O2, an omega-6 fatty acid found in vegetables, nuts, grains, seeds, fruits and their oils. Oils rich in linoleic acid include (in descending order) safflower, sunflower, corn, soybean and cottonseed. C18H30O2, an omega-6 fatty acid, thought to be cardioprotective. It reduces the production of cytokines and down-regulates serum cell adhesion molecules thought to be intermediates in atherosclerosis. An obsolete term for uric acid. C21H41O7P, an acid purified from the ascitic fluid of patients with ovarian cancer. LPA stimulates the growth of ovarian cancer and may be a useful screening test for the disease. C4H6O5, an acid found in sour fruits such as apples and apricots and active in the aerobic metabolism of carbohydrates. C3H4O4, a dibasic acid formed by the oxidation of malic acid and active in the Krebs cycle in carbohydrate metabolism. Malonic acid is found in beets. Its inhibition of succinic dehydrogenase is the classic example of competitive inhibition. C4H6O2, a colorless acid used to make methyl methacrylate. A fatty acid containing one double bond between carbon atoms. It is found in olive oil and is the predominant fat in the Mediterranean diet. It is thought to reduce low-density lipoprotein levels without affecting high-density lipoprotein levels. A nontechnical term for hydrochloric acid. HNO3, a colorless, poisonous, fuming corrosive acid, widely used in industry and in chemical laboratories. HNO2, a weak acid chemical reagent used in biological laboratories. An acid, such as lactic acid or sulfuric acid, that accumulates in the body as a result of digestion, disease, or metabolism. It cannot be excreted from the body by ventilation but must be excreted by organs other than the lungs, e.g., by acidification of the urine. 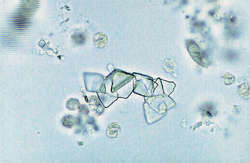 C44H68O13, a toxic acid found in shellfish. The toxin is produced by oceanic phytoplankton consumed by filter-feeding marine animals such as clams, crabs, and mussels and is the cause of diarrheal shellfish poisoning. Ingestion of these shellfish by humans results in profuse watery diarrhea. C18H34O2, a monounsaturated fatty acid found in most organic fats and oils. Any of the nonessential unsaturated fatty acids that have a double carbon bond in the ninth position from the end of their fatty acid tail. They include oleic acid (present in olive oil), stearic acid, and erucic acid. An acid containing the carboxyl radical, –COOH. Organic acids include acetic acid, formic acid, lactic acid, and all fatty acids. C5H4N2O4 , a crystalline acid occurring in milk. It is a precursor in the formation of pyrimidine nucleotides. C2H2O4, the simplest dibasic organic acid. Its potassium or calcium salts occur naturally in rhubarb, wood sorrel, and other plants. It is the strongest organic acid and is poisonous. When properly diluted, it removes ink or rust stains from cloth. It is used also as a reagent. C4H4O5, a product of carbohydrate metabolism resulting from oxidation of malic acid during the Krebs cycle. It may be derived from other sources. C16H32O2, a saturated fatty acid occurring as esters in most natural fats and oils. C9H10N2O3, a derivative of aminobenzoic acid. The salt, para-aminohippurate, is used to test the excretory capacity of the renal tubules. C17H24O16, an acid derived from pectin by hydrolyzing its methyl ester group. A synthetic nucleic acid analog in which natural nucleotide bases are linked to a peptide-like backbone instead of the sugar-phosphate backbone found in DNA and RNA. 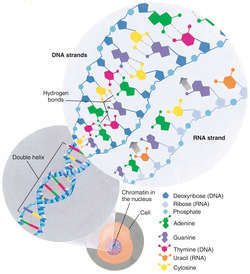 PNA has numerous uses in gene regulation, splicing, and therapy; in hybridization; and as a molecular diagnostic assay. HClO4, a colorless unstable liquid compound. It is the highest oxygen-containing acid of chlorine, strong and dangerously corrosive. An acid formed by oxidation of phosphorus. The phosphoric acids are orthophosphoric acid, H3PO4; pyrophosphoric acid, H4P2O7; metaphosphoric acid, HPO3; and hypophosphoric acid, H4P2O6. The salts of these acids are phosphates. Orthophosphoric acid, a tribasic acid, is used as a 30% to 50% solution to etch enamel of teeth in preparation for bonding of resin dental restorations. H3PO3, a crystalline acid formed when phosphorus is oxidized in moist air. C6H18P6O24, a pale, water-soluble acid that is found in cereal grains and, if ingested, may interfere with the absorption of calcium and magnesium. (C2H2O2)n, a polymer of glycolic acid anhydride units. It is used to manufacture surgical sutures, clips, and mesh. C3H6O2, a carboxylic acid present in sweat. C8H9NO4, a crystalline acid that is the principal end product of pyridoxine metabolism, excreted in human urine. C3H4O3, an organic acid that plays an important role in the Krebs cycle. It is an intermediate product in the metabolism of carbohydrates, fats, and amino acids. Its quantity in the blood and tissues increases in thiamine deficiency because thiamine is essential for its oxidation. C7H12O6, a crystalline acid present in some plants, including cinchona bark, and berries. C20H28O2, a metabolite of vitamin A used in the treatment of cystic acne. C18H34O3, an unsaturated hydroxy acid making up about 80% of fatty acids in the glycerides of castor oil. It has a strong laxative action. C9H9NO4, an acid found in the urine after ingestion of salicylic acid or its derivatives. A fatty acid in which the carbon atoms are linked to other carbon atoms by single bonds. Any of a family of acids containing silica, such as H2SiO3 (metasilicic acid), H2SiO4 (orthosilicic acid), or H2SiO7 (pyrosilicic acid). When silicic acid is precipitated, silica gel is obtained. C4H6O4, an intermediate in carbohydrate metabolism. Any of the organic compounds having the general formula SO2OH, derived from sulfuric acid by replacement of a hydrogen atom. C7H6O6S3, a crystalline acid soluble in water or alcohol. It is used as a reagent for precipitating proteins, as in testing for albumin in urine. H2SO4, a colorless, corrosive, oily, viscous acid prepared from sulfur dioxide and used in many industrial processes and in clinical laboratories. Industrial accidents involving sulfuric acid through contact with skin or inhalation of aerosols are common. H2SO3, an inorganic acid and a powerful chemical reducing agent used commercially, esp. for as a bleach. C76H52O46, a mixture of digallic acid esters of d(+) glucose prepared from oak galls and sumac. It yields gallic acid and glucose on hydrolysis. C4H6O6, an acid obtained from by-products of wine fermentation. It is widely used in industry in the manufacture of carbonated drinks, flavored gelatins, dyes, and metals. It is also used as a reagent. It is thought to be an allergen. C26H45NO7S, a bile acid that hydrolyzes to cholic acid and taurine. Any of the polymers found in the cell walls of some gram-positive bacteria, such as the staphylococci. C8H15NO2, an antifibrinolytic drug that has approx. 10 times the potency of and more sustained activity than aminocaproic acid. It is used to decrease bleeding time during surgical procedures. Loss of blood is decreased when this drug is used. The solid fat produced by heating liquid vegetable oils in the presence of hydrogen and certain metal catalysts. Partial hydrogenation changes some of the unsaturated bonds to saturated ones. The more trans-fatty acids in the diet, the higher the serum cholesterol and low-density lipoprotein cholesterol. A drug used as a caustic to destroy certain types of warts, condylomata, keratoses, and hyperplastic tissue. An organic acid in which some of the carbon atoms are linked to other carbon atoms by double bonds, thus containing less than the maximum possible number of hydrogen atoms, e.g., unsaturated oleic and linoleic acids as compared with the saturated stearic acid. Polyunsaturated fatty acids include linoleic acid and alpha-linoleic acid. Uric acid must be excreted because it cannot be metabolized. Uric acid output should be between 0.8 and 1g/day if the patient is on an ordinary diet. Increased elimination is observed after ingestion of proteins and nitrogenous foods, after exercise, after administration of cytotoxic agents, and in gout and leukemia. Decreased elimination is observed in kidney failure, lead poisoning, and in those who eat a protein-free diet. C8H16O2, an acid used to treat seizure disorders. C9H10O5, a principal metabolic product of catecholamines. VMA makes up approx. 90% of the metabolites of the catecholamines epinephrine and norepinephrine and is secreted in the urine. People with pheochromocytoma produce excess amounts of catecholamines; therefore there are increased amounts of VMA in their urine. An acid produced from carbon dioxide (CO2). It can be excreted by the body by ventilation (colloquially, “blowing off CO2”). Vitamin C. A white, crystalline substance found in citrus fruits, tomatoes, potatoes, and leafy green vegetables. Small doses are needed to prevent the bleeding disease of SCURVY and regular large doses are useful as an antioxidant in combatting dangerous FREE RADICALS. The drug is on the WHO official list. A brand name is Redoxon. a water-soluble organic compound, found in citrus fruits, green vegetables and tomatoes. Formula: C6 H8 O6. Its best-known role is in the formation of COLLAGEN, the chief component of CONNECTIVE TISSUE. Deficiency in ascorbic acid results in the disease called SCURVY which is characterized by changes in collagen leading to many further effects. Ascorbic acid acts as a VITAMIN in humans, but rats and most other mammals can manufacture their own supply from D-glucose. Another term for vitamin C, a nutrient found in fresh fruits and vegetables. Good sources of vitamin C in the diet are citrus fruits like oranges, lemons, limes, and grapefruits, berries, tomatoes, green peppers, cabbage, broccoli, and spinach. vitamin C. See also vitamins; appendix 4.2 . Vitamin used to prevent scurvy, as a strong reducing agent, and as an antioxidant. uses: vitamin C deficiency, scurvy, delayed wound and bone healing, chronic disease, urine acidification, before gastrectomy. vitamin c, called also cevitamic acid; a substance found in many fruits and vegetables, especially citrus fruits, such as oranges and lemons, and tomatoes. It is synthesized by most animal species, except primates, guinea pigs, fruit bats and some birds and fish, and so is not a dietary requirement in ordinary circumstances except for the species named. occurs in primates and guinea pigs with inadequate dietary intake; affected animals are weak, depressed, anorectic, and have enlarged joints. In farm animals the only example of a possible secondary deficiency is a dermatosis of young calves which occurs at a time at which ascorbic acid levels might be expected to be at their lowest. The syndrome includes heavy dandruff, alopecia and a waxy crust on the skin. Q. Why is vitamin C so important? As a kid my Mum always told me to take vitamin C every day. Is it really important and if so how to take a day? A. Vitamin C, also known as ascorbic acid, is a water-soluble vitamin. Unlike most mammals, humans do not have the ability to make their own vitamin C. Therefore, we must obtain vitamin C through our diet. Vitamin C is required for the synthesis of collagen, an important structural component of blood vessels, tendons, ligaments, and bone. Vitamin C also plays an important role in the synthesis of the neurotransmitter, norepinephrine. Neurotransmitters are critical to brain function and are known to affect mood. For the full article: http://lpi.oregonstate.edu/infocenter/vitamins/vitaminC/ Hope this helps. Q. Is the high intake of ascorbic acid helps to reduce weight, while dieting? Hi all…..I am 23, male. I have tried dieting to lose weight but in vain. Is the high intake of ascorbic acid helps to reduce weight, while dieting? A. Ascorbic acid is actually vitamin C. It may not necessarily help you to drop the pounds, but a deficiency in vitamin C can cause weight gain because of a slowed metabolism. It is also needed for the growth and repair of tissues in all parts of your body, and too little can cause an increase in easy bruising and dry, scaly skin! It is essential for the healing of wounds, and for the repair and maintenance of cartilage, bones, and teeth. It is a good antioxidant, needed to block some of the damage caused by free radicals, which are by-products that results when our body transforms food into energy. Antioxidants also helps in reducing the damage to the body caused by toxic chemicals and pollutants such as cigarette smoke. The body does not manufacture vitamin C on its own, so it is important to include plenty of vitamin C-containing foods in your daily diet, or to take a vitamin C supplement.